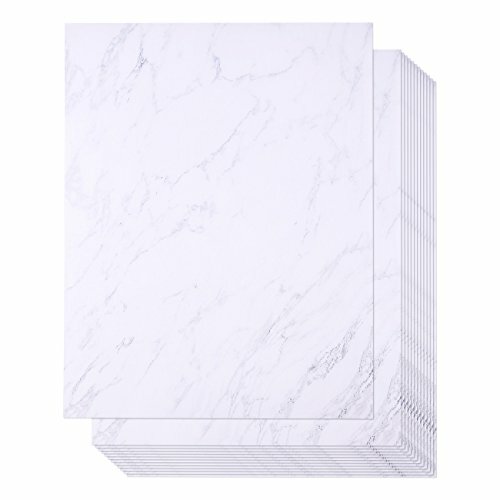 When you want to write or print something and give it a special touch, reach for these marble pattern stationary papers. At 100gsm, it's easy to manipulate and feels just like standard household printer paper. Use it like writing paper or printer paper, it's your choice. MARBLE PATTERN STATIONARY SET: Includes 96-sheets of double-sided marble-patterned stationary. Both the papers and envelopes are printer and handwriting friendly. VERSATILE: Write or print motivational messages, thank you notes, letters and announcements with these sheets of paper. MADE FOR ALL OCCASIONS: Perfect for weddings, anniversaries, birthdays, graduations or just writing letters. EASY SEAL ENVELOPES: Apply water to edges of flap and stick. DIMENSIONS: Each paper sheet measures 8.5 x 11 inches.